Bruiser Truescale Wheels from RC4WD don't fit on my Bruiser?! 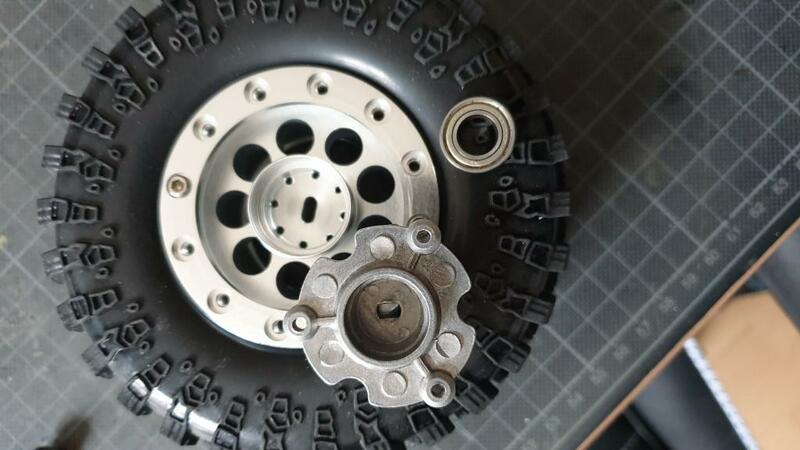 I've bought new RC4WD truce scale rims for my Brusier but I can't mounting them. It seems, that some parts missing. I think there is missing 4 ball bearings and/or a filling part between ball bearing and rim. Is this part exclude or what do I need? 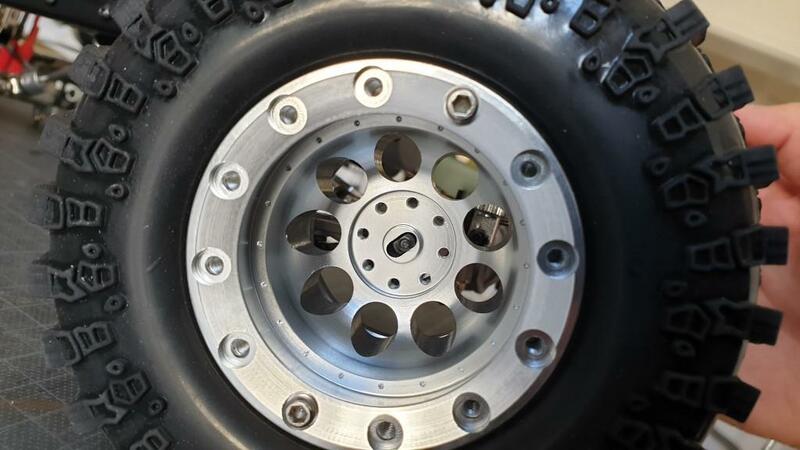 I'll look at my Bruiser in a bit, but it looks like you replace the stock hubs that the stock wheels bolt on with the included hardware you posted. 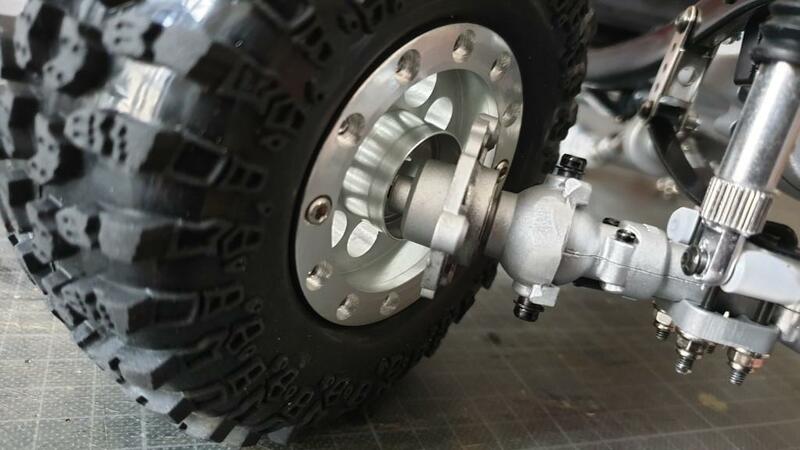 The stock hardware appears to get replaced with the plastic bearing carriers and then they slip over the stock axle, place the wheels over the bearing carriers, secured with the provided lock nuts and then covered with the faux 4wd hubs. ...but I havn't this 4 black round ball bearing carriers... sh*t! Ooooo, I missed that part. You will have to wait and see. If the stock set up fits you won't need it. The stock set up is the same. The seller Tamico says: "RC4WD says, the carton content is wright, no extra accessoires"
I say: that's world biggest bullsh*t I ever heared. Not possible to mount! Maybe you have to use the bearings and bearing adapter rings that come in the rere bruiser kit? Where??? I havn't any adapters in the Kit. The inner circle seems to be smaller than in the manual shown and have no black bearings carrier inside. My wheel hub contents only the bearing. However, I order now 8x22x6 ball bearings. These have the same dimension like the black bearing carriers. Stupid question but do you have an original Tamiya Bruiser or is it that clone? Those hubs don't look like Tamiya ones,and i have both the original and the rere. OP I think maybe you have the clone and the dimensions are off. If you order the rere black bearing carrier you should be gtg and ready to rock and roll! Maybe the clone.... I don't know. 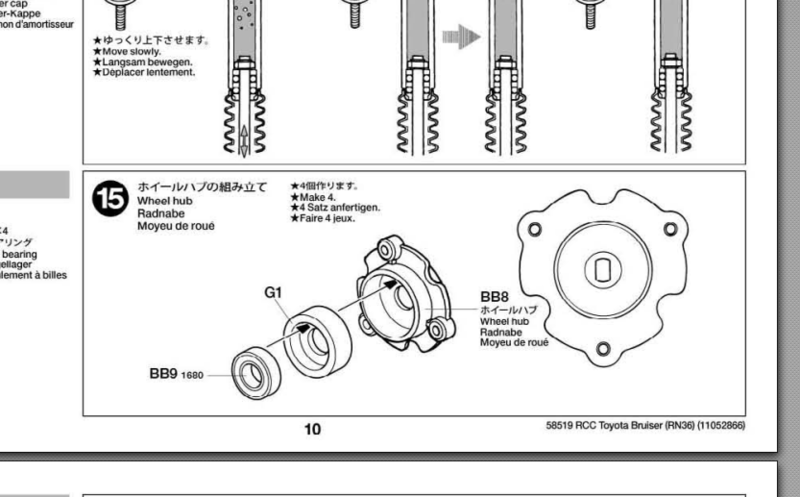 I have ordered ball bearings in 22mm size and that's the easiest way to "fix" the problem. Somebody is selling clone leftovers as genuine parts on German eBay Kleinanzeigen. 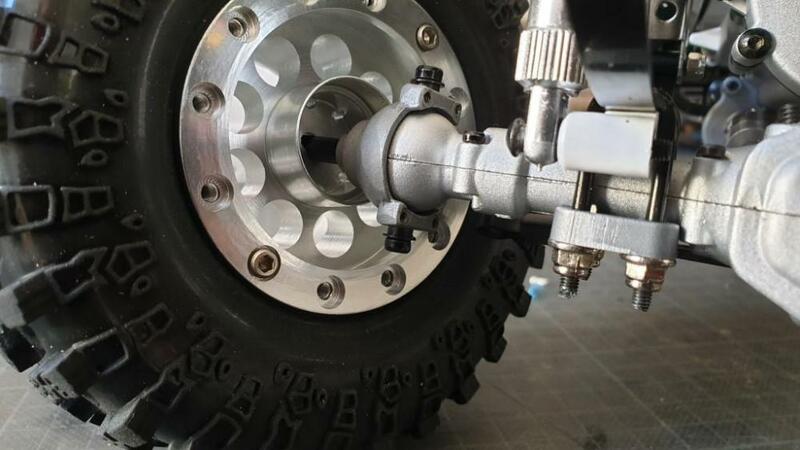 Rims and wheel adapters. So not done, tss tsss. Dunno why re-re bothered changing to 1680. Olden 608s (22x8) you could just steal spares off your rollerblades BiTD. Or in recent years... harvest them out of those "finger spinner" rubbish the kids have abandoned. Agreed, that's so just not reich!! Speaking of which... this year finally caved in & bought some re-pop 3rd party parts to suit Mercedes. They looked like they'll last longer than the factory original so hey why not. I'm not sponsored by Stuttgart.